Soila, Diana and security staff great!!!! Our family and i appreciate your kindness. We have been staying there for 4 years in a row and already planning to stay there next year!! Thanks for a great vacation!! God Bless you all , see tou next year. The was a problem with the parking space. It was taking care right away. We have a great time. Thank you very much for everything. We had an awesome weekend and were already planning our summer vacation at Seabreeze 1 ! Great place to vacation. Love the front office staff. Very helpful and very friendly. Caring knowledgeable staff who cater to your needs. We love the staff! Everyone is friendly and they all go out of their way to speak to you and help in any way they can. 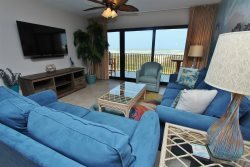 We look forward to our yearly stay and will continue to come to the Seabreeze 1 property. Everyone at the management staff was friendly and helpful. We appreciated their support and communication for our visit to South Padre Islands. I made a booking mistake and needed to slide my reservation two days over in order to accommodate a change and called to see if that was possible. The change was made and it was SO easy! Front desk staff was super helpful and lovely to work with. We stayed at Seabreeze during Spring Break and called ahead to check on weather conditions and talked about the possibility of cancelling. We were given the option to even move our reservation to another date with out loosing our deposit which surprised us. In the end, we decided to keep our reservation and we had sunny weather 3 of the 5 days. We love Seabreeze and will come again. The property was quiet and well maintained. We especially loved that they don't accept Spring Breakers during the month of March so we were sure that we were able to get a good night of sleep! Security was present at night making sure that the property and renters were all following that rule and we liked that! Calling me the day before to share that early check in was available was the cherry on top. That added more time for us and Soila answered the phone very quickly. When I showed up Dianna was just as friendly and worked very fast to get us in. Loved it. We enjoyed our vacation from start to finish. Early check in was a plus. It was spring break so the weather was cold. We didnt get to enjoy the beach much but staying in was so much better. I love the whole condo. The art work. The kitchen utensils. The master suite was to die for. The pictures do not show the full master bath. So the shower surprised us. What a lovely surprise. The walls are well insulated that we could not hear into each room. The massive open floor plan helped us all spend time together. It was a nice setting and updated environment. A++ from us. Deanna was the staff member who took care of us. She is so courteous and such a happy person. She explained all over the phone expertly. When we arrived she was there to greet us with a big smile. She made us feel at home and even before viewing the property we knew with her welcoming demeanor that we would definitely return. First impression is the best selling point of any business and the Seabreeze1 definitely has this with their great customer service. Excellent! We stayed in condo 103 and it was more beautiful and accommodating then described on the website. One reads good and bad reviews, one is prone to focus on bad, however there is nothing bad to describe Seabreeze1. The cleanliness and beauty of the unit and grounds was superb. Beach access was amazingly close. Which was a great surprise since other locations advertise beach access but one has to walk a quarter of a mile to get there. Beach access was really really just steps away which is awesome. Our family is planning to visit SPI this summer and we will definitely choose Seabreeze1 as our home away from home for all future stays on the Island. The office manager was friendly and helpful so was maintenance and security staff. Love the staff here! They have always attended to any problem that arises in a timely manner. They are professional in their behavior but yet we feel they are part of our winter Texan family. We love it here! We do have a couple of suggestions for our stay next season in unit 204. 1. We really need 2 additional chairs for the table (folding chairs would be ok). 2. The light above the table doesnt give out enough light. Would appreciate something a bit brighter. Thank you! One of the best vacation properties we stayed in. Office staff are excellent. They are engaged and converse and are interested in our families. If there is a need, things are addressed promptly. I would like a little more 70+ degree weather in January - but they can't fix that! I worked with Dianna on my arrival. We were not sure what time we would be coming in. She walked me through the late arrival process and made sure I understood what to do in case we got there late. Loved the property. Loved the view. Loved the beach access. Next time we will come late February or September. It was very cold while we were there. We did still swim in the ocean, visited the Sea Turtles, went to the whaling wall, took surfing lessons (in 50 degree weather!) and found some great places to eat. We used the hot tub at least once every day, so happy that we had that to warm up in on some of the colder days. Efficient and helpful in every way. Well maintained property in a great location. Arrived after 5 Soila made it so easy for late check in. Condo was perfect clean and convenient, best part right at the beach.